Thus far my female scribe research is still concerned with nunneries and their capacities for scribal activity (Should you wish to visit the previous posts in this series: Part I, Part II, and Part III). My most recent find was another book by Michelle Brown in line with her previous one, but illuminating another piece of female agency within scriptoria. Consequently this lead me down a whole new path of research. The primary focus relied on excavations where numerous whole and fragmented styli were found in Anglo-Saxon nunneries. While the best indication of manuscript creation is typically the manuscripts themselves, tools for such endeavors often survive just as long and can in some cases be even more indicative – a manuscript may not always have a clear, paleographically traceable provenance, whereas the tools were there for a distinct purpose. I want to digress for a moment just so we can look at these writing instruments and better understand what they were for. This will probably not aid in the overall scope of this project, but the historical value associated with these tools is just too exciting to pass up. Syli were used for purposes such as pricking, ruling leaves, hard point annotating, and underdrawing. These instruments were generally made of iron or bone, but sometimes of other alloy metals and even silver (a significant point that will be addressed later). This is an early medieval stylus found in North Yorkshire dated to be from around 900-1000 AD. 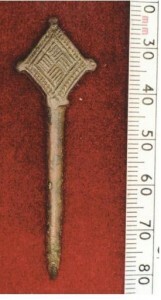 The elaborate design on the handle tells us it was either meant as a gift, and probably belonged to a member of the upper class or a high ranking member of the clergy (or perhaps all of these things are true, and it could have been a gift for someone high in the clergy who also happened to belong to the upper class). 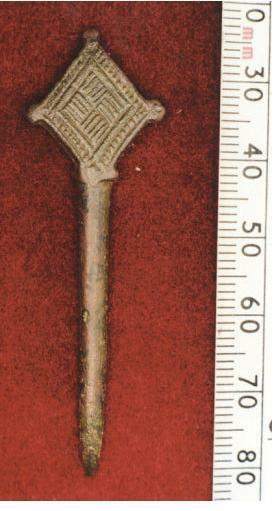 However, not very much is known about this particular one, especially whether it belonged to a male or female. The material is primarily a copper alloy. 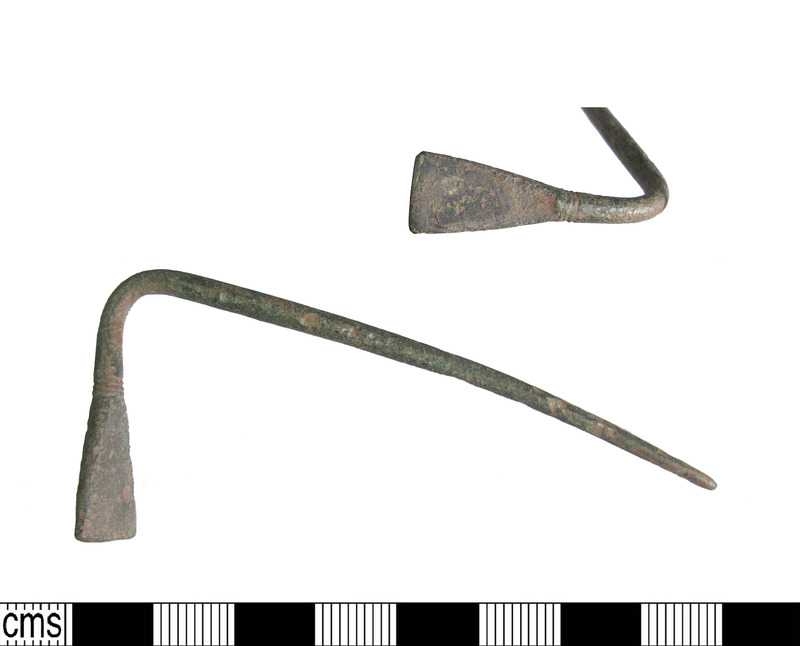 Here is a stylus that dates from around 700-800 AD that is also made from copper alloy which was found near Lincolnshire. This one is obviously far more simplistic and by all appearances had a very utilitarian purpose. Of the styli found from this period (of which there are not as many as you would think), most of them resembled this rather than previous or the following one. There appears to be an animal’s head engraved into it, but due to corrosion the animal cannot be identified. This was however, a rather common practice in the Anglo-Saxon culture where elaborate engravings served to denote another kind of literacy – a cultural one where such symbols and puzzles were read for a meaning we don’t quite as easily grasp in modern times. The animal depicted here appears to either have its tongue out, or is biting something. While I have not done any studies on styli before this, I have studied jewelry and brooches from the period, and this style that developed around 600 AD used these sort of representations of animals biting or eating each other to remark on the natural order of the world. It was also believed that different animals had proprietary characteristics that would be transferred to the objects they decorated. However, since this animal here is undecipherable, I wouldn’t even know where to begin with that. 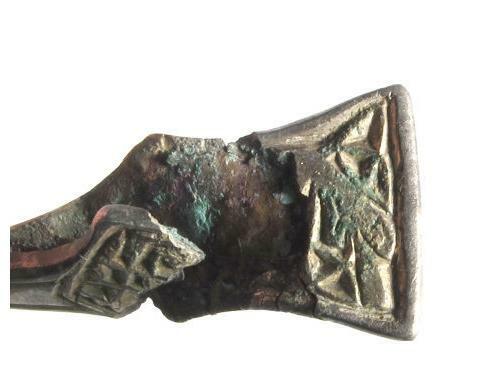 (And here is an amazing article about Anglo-Saxon pins by Anna Gannon). 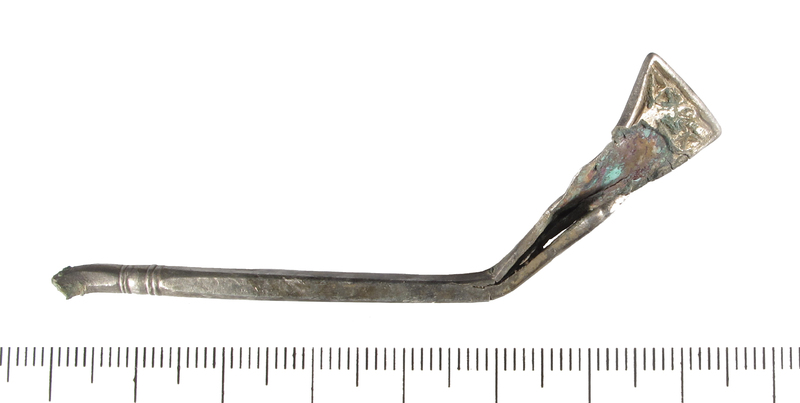 This last silver ornamental stylus could quite possibly resemble the one gifted by Boniface’s successor to Abbess Eadburga who educated Boniface’s relative, Lioba, who in turn went on to become abbess of Bischofsheim. The relationship between Eadburga and Boniface, however, is not restricted to this particular incident and extends to mutually beneficial transcription activities where Boniface would visit Eadburga’s Minster-in-Thanet to have highly detailed and ornamental manuscripts copied. Of the many books copied under her supervision, perhaps the most famous is the Selden manuscript of the Acts of the Apostles that have “EADB” scratched with a stylus at the end. Conjectures have bee made that this particular manuscript may have not just been supervised by Eadburga, but actually coping in her hand. Further, this particular manuscript contains numerous female pronouns leading to further inferences about the intended audience. While the female pronouns, just like the one found in the Lancelot manuscript (that I discuss in previous segments of this project) indicate a female author, these pronouns do not necessarily imply a female audience – and such a conclusion would require quite a leap in logic. Unfortunately the Boldleian does not have any pictures online of the Selden MS Supra 30. If anyone has seen it, I would love to hear impressions on it. Blackhouse, J and Webster L. The making of England: Anglo-Saxon Art and Culture. The Uses of Literacy in Early Medieval Europe. ed. Rosamond McKitterick.